Ah, Memorial Day. The start of summer and the start of airline delay season. Is there anything worse than getting stuck in a thunderstorm in Chicago and not being able to do anything except sit on terminal hold and hope for some agent in India to pick up the phone before you get to the front of the airport line? Fortunately, the mobile phone is the next frontier when it comes to travel, and there are some pretty helpful applications out there right now that can help you out this summer. This is probably the most useful thing you can find on your phone. If you need to pick someone up or you just want to know their flight status, your only option used to be to call the airline if you weren’t near a computer. Now there are plenty of places you can go using your cell phone. If you think about it when you’re at home, you can go to some airlines’ websites and sign up for flight alerts. American is one that does that. But this doesn’t work for all airlines. You can sign up for alerts for all airlines from FlightAware in advance, but that also requires forethought. Another option is to use one of several SMS services. Send a text message with the airline and flight number and you’ll get an instant text message back with flight information. You can text Google at, um, Google (466453) (at left) or you can text 4INFO at, um, 4INFO (44636). Both are free, but I like 4INFO because it’s more flexible. For example, with 4INFO you can send a message that says “UA LAX ORD” and it will give you a full list of the flights operating that day. With Google, you need to know the flight number. One quick note. Only the airline notification systems show gate to gate times. The rest of these will tell you when the plane leaves the departure runway and lands on the arrival one. So you’ll need to build in some extra padding if you’re picking someone up. Also, this information is only available for travel in the US, so international times aren’t very reliable, if they’re available at all. It’s probably not well known that you can get projected security wait times on the TSA website. Now you can also get it on your cell phone. Text 4INFO with “wait” and the airport code and you’ll get the most recent estimated wait time for each terminal using history from the last month (at right). If your flight is at 7p, don’t send a text message at noon. You’ll get wait times for noon, and that won’t help. I’m starting to sound like a commercial for 4INFO here, but I promise this is the last one. On the FAA website, you can search for delays by airport. This is especially helpful when the weather is bad or if you’re flying to O’Hare. Either way, there will be a lot of delays and you can get a heads up. You can also get this info by sending a text message to 4INFO saying “delay” and then the airport code (at right). Booking a flight is about as advanced as you can get using a cell phone, and for that reason it isn’t very popular in the US yet. I believe US Airways is the first US-based airline to announce it will offer mobile booking in the near future. You can go to usairways.com sometime soon and book yourself a trip. 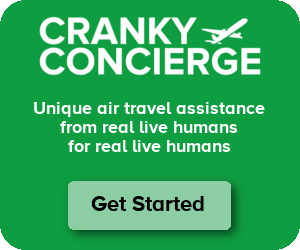 This is probably most helpful when you miss your connecting flight or the flight you’re on is canceled. You can just whip out your phone and beat everyone else to those few empty seats on the next flight. I’m guessing you’ll have to have a stored profile including a credit card on the site so that you can book quick and easily. That brings me to the next cool thing – TripSync. This service lets you book travel in a variety of different ways including through your Microsoft Office calendar. It’s primarily for business travelers, but I signed up on my own so it seems anyone can use it. They’ve just introduced a mobile application so once you’re account is all set up, you can book while you’re on the road. Best of all, there is no fee, unlike most online travel agents. As you can see at left, the interface looks pretty good on a PDA-sized screen. But when I tried to pull it up on my basic phone, it was definitely not so pretty. Still, it can get the job done and that’s what is most important. So, happy summer travel season to everyone. I’ll be back on Tuesday after the long weekend. Update 5/25 @ 1130a: Looks like Northwest actually now has mobile booking as well, beating US Airways to the punch. AA also allows users to send an email to status@aaflights.com to get (what else?) flight status info. The response time has been very good lately. This one only took 20 seconds to respond. It doesn’t handle non-text messages very well (or at all), so be sure you send just text, not HTML. Once or twice I have received updates about a major delay or cancellation before the info was posted at the gate. But that may not be shocking. Thanks for the great coverage of our new 4INFO flight services. I hope all your readers can avoid the wait times at the airport this busy travel weekend!